Copenhagen is the world’s happiest capital — haven’t you heard? Regularly topping official global happiness surveys, this compact historic city of nearly 2 million offers such an irresistible mix of cozy storybook charm and 21st-century cool, you too may want to move here… immediately. Along cobblestoned streets and pretty canals, ridiculously attractive locals pedal their bikes to their beautiful apartments. They shop at gorgeous organic supermarkets like Irma, worship midcentury modern design, and eat at restaurants serving the kind of locavore new Nordic fare that — following the visionary Noma restaurant — made the city the global food hot spot. Shopaholics beware while in Copenhagen: You’ll want to refinance your house to bring back artful fashions, lighting, and tableware. Yes, the steep prices might put a dent in your happiness. Then again, that crisp northern air, the stunning flowerbeds, and Europe’s best people-watching come free. Splurge: Hotel d’Angleterre – Right off Stroget pedestrian shopping street, this landmark grande dame in a stately 18th-century palace emerged from a two-year makeover with polished marble, silk wallpaper, inch-deep carpets, and spiffed-up original detailing. The design of the 90 dreamy rooms and suites plays off the original neo-classical look, the spa boasts the city’s only indoor swimming pool, and the Balthazar Champagne Bar buzzes with blond fabulosi. Have lunch at Marchal restaurant. Its unstoppably creative Michelin-starred Chef Ronny Emborg cooks fashion-forward dishes like roast turbot with pink grapefruit, dill oil, and foamy mussel sauce. Steal: Axel Guldsmeden – The local Guldsmeden boutique hotel deserves kudos for its fierce eco-commitment. In the trendy former red light district of Vesterbro, close to the train station and Tivoli Gardens, this 129-room property is stylishly green. Expect organic eggs for breakfast, soft bamboo fiber sheets on the four-poster bed, and fragrant Fischer Pure Nature toiletries by the stone bowl sink in the bathroom. Designed with teak, grasscloth, and Eastern textiles, the Bali-inspired guestrooms are an exotic break from Nordic minimalism. To lessen street noise, book a room facing the central garden. Breakfast: Torvehallerne Market – Copenhagen’s major caffeine cred is owed to the super-serious brews at cult micro-roastery the Coffee Collective. After sniffing out the almondy notes in your Guatemalan El Diamante joe at the new market outpost, stop by the incredible Grod porridge stall for organic oatmeal with dulce de leche. Follow that with chocolate-covered marshmallows from Summerbird. Lunch: Slotskaelderen hos Gitte Kik – Locals adore the ur-classic smorrebrod — open-faced sandwiches — at this beloved parliamentarians’ hangout. At the cozy space, housed in a 1797 building with dark wainscoting, choose between dozens of sandwiches arrayed on the counter. Herring in traditional egg curry sauce? 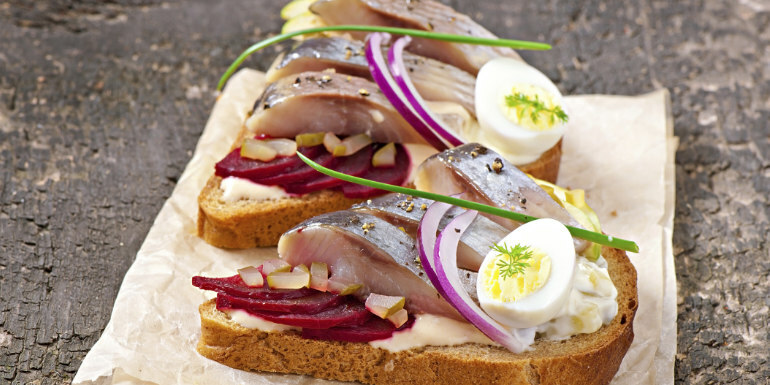 Pickled halibut with dilled mustard or corned beef with fresh horseradish? We recommend smoked eel with scrambled eggs, and a bracing shot of aquavit. Dinner: Kodbyens Fiskebar – Located inside a trendy former slaughterhouse complex in Vesterbro, this industrial-chic space trades in sparkling-fresh seafood with new Nordic accents. Don’t be misled by the hipster vibe: Noma-trained Chef Anders Selmer delivers serious sophistication in dishes like hand-dived scallops with hay-smoked apples, or earthy squid accented with beets, bone marrow, and pickled elderberries. Just slurp briny oysters and sea urchins at the raw bar. Drinks: Ruby – Cocktail connoisseurs gather at this grand 18th-century bar. Classic drinks come with modern locavore twists, such as the homemade quince cordial that transforms a gin gimlet, or a tangy daiquiri updated with rhubarb. Tip: Eating out three times a day can get pricey. Luckily, all of the parks and waterside benches — and fabulous food shops — make Copenhagen a great picnic city. Buy dense Danish rye, craft cheeses, and smoky hams from Torvehallerne Market or Irma supermarket to eat on a lawn at King’s Garden. Or take out a stylish canapé box from the cool Aamanns Deli. Tip: Locals are justifiably proud of their microbrews. Currently, the place to be seen is an outdoor wooden table of the hip Mikkeller Bar in Vesterbro. From the brewery’s dozen-plus tap offerings, try the hoppy light. 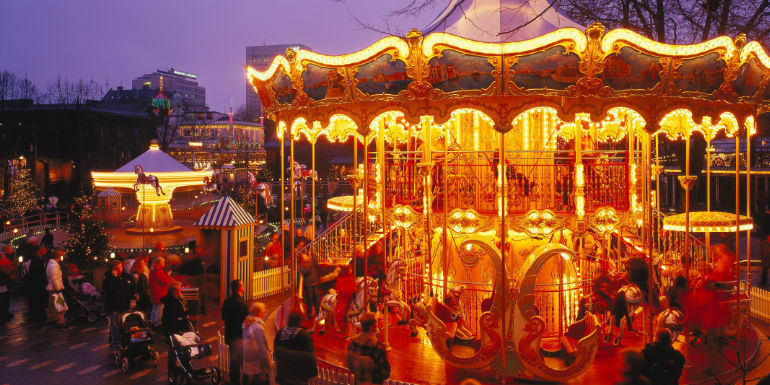 For Everyone: Tivoli Gardens – The world’s second-oldest amusement park opened in 1848, and Copenhagen’s magic kingdom served as Walt’s inspiration for Disneyland. But this one is far more cozy and quaint than Disney’s corporate theme parks, with dragon boat rides on a sweet little lake, whimsical Chinese pagodas, Moorish pavilions, and of course, shops, rides, and restaurants. Look for elegant outlets of stores like Illums Bolighus and Bodum. Teenagers must dare the Demon (a 50 mph roller coaster), while the Flying Trunk (an enchanting ride through Hans Christian Andersen fairy tales) is a hit with the little ones. Lunch on a classic hot dog (on a brioche bun with creamy remoulade sauce) from Andersen Bakery, or grandmotherly Danish fare at Groften. For Couples: Danish design – Those famous clean lines, eye-popping colors, and perfect marriage of form and function make Copenhagen ground zero for global design geeks determined to strip the city of every last Panton lamp, Wegner chair, and Jacobsen door handle. Start with a historical survey at the beautifully curated Design Museum. Gawk at classic midcentury modern pieces — and their current knockoffs — at the elite Dansk Mobelkunst and the cool Casa Shop. Something transportable? The stylish Illums Bolighus is a good source for Arne Jacobsen’s cutlery and much more. Nearby, Royal Copenhagen and Georg Jensen are meccas for classic porcelain and silverware, respectively, in traditional and trendy designs. Bargains? Try the Royal Copenhagen Factory Outlet in Frederiksberg, and the hip Flying Tiger chain full of sleek affordable knickknacks. For Families: Children’s Museum – Hans Christian Andersen’s town is the world’s most kid-friendly capital. (Doesn’t the city itself look like a toy?) As if castles and palace parks weren’t enough, the National Museum has a dedicated Children’s Museum inside it. At this interactive fun house, rosy-cheeked local juniors climb aboard a replica of a 10th-century Viking ship, touch the star-shaped spurs of medieval riding boots (look Ma, no heels! ), and try on vintage garb in the “Grandma’s Wardrobe” section. For the Adventurous: Danish Riviera – Travel by train or bike a few miles north of the city, and you’re in the romantic northern riviera of white sands, crystal waters, and those super-toned Danish bodies arrayed on designer towels. First stop: Klampenborg’s Bellevue Beach, where many buildings — including the lifeguard towers — were designed in the 1930s by Arne Jacobsen, Denmark’s architectural guru. Continue north to Louisiana, a modern-art museum with Europe’s dreamiest setting. Linked by glass walkways, the museum’s modernist structures are set on a luscious green hill dotted with Calder and Giacometti sculptures. Right below is the expanse of the Oresund sound. Who even needs art? For bike rentals, try the ever-reliable Kobenhavns Cyklebors. Most official tourist websites are a waste of time, but not Visit Copenhagen, whose clued-in editors assemble opinionated, useful, and really au currant lists and tips. 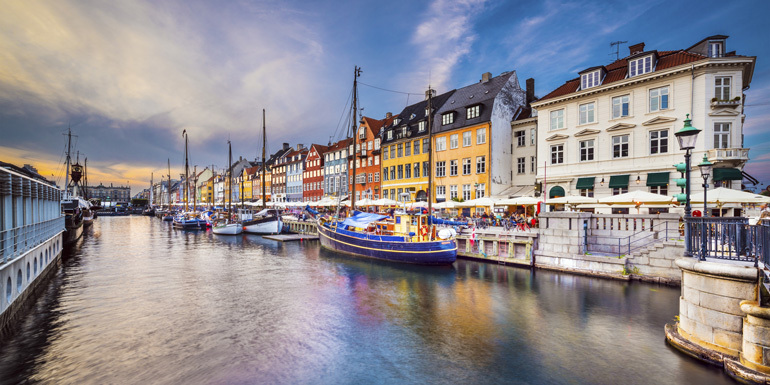 And don’t forget to get the Copenhagen Card, which includes transportation passes and admissions to most major attractions — a genuine money saver. What do you like best about Copenhagen?